Most of us lead busy lives, and getting to the gym isn’t always guaranteed when we have so many other responsibilities keeping us occupied. For that reason, it is important to make the most of your precious workout time. At Twitch, By The Lagree Studio, we know that group exercise classes are one of the most efficient ways to engage in a workout because you are able to get an intense workout in a short amount of time. With dozens of types of exercise, followed by hundreds of fitness classes available, picking the right one can be confusing. It is important to consider certain aspects when choosing a class. Whether you are trying to build bulky muscles that Dwayne “The Rock” Johnson would be jealous of, lose weight to get back into your old high school letterman’s jacket or cheerleading uniform, achieve that long, lean body you’ve always wanted, or just improve overall mental and physical health, having a fitness goal is vital. Creating a goal will help to choose which type of group exercise is best for you, whether it is weightlifting, kickboxing, yoga, etc. The t3 Approach at The Lagree Studio stands for Total Twitch Training and is a total-body, transformational workout that increases lean muscle strength, muscular endurance, cardiorespiratory stamina, balance, and core strength. 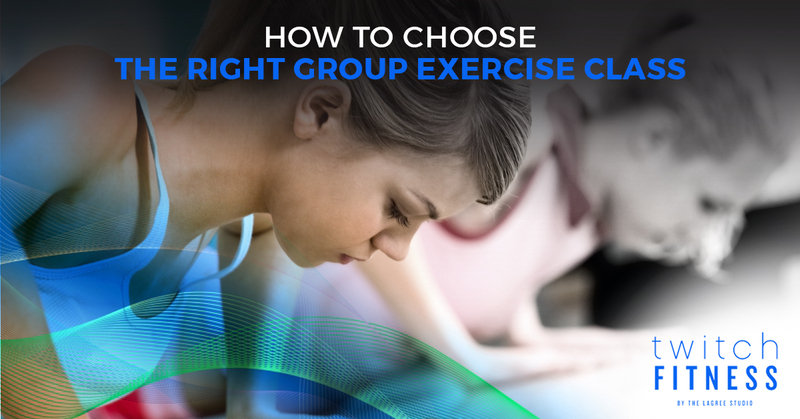 It is one of the most holistic types of exercise available, and participating in a group class can help achieve fitness goals you didn’t even know you had. As important as it is to know your goals, it is also important to recognize your limitations. Perhaps you suffered an injury and have limited range of motion. Maybe you have been dealing with painful joints and can only do low-impact exercise. In the past, your options for low impact exercise might have been limited to walking, swimming, and using the elliptical. But thankfully that is no longer true. At Twitch, we recognize that no two bodies are the same. Our t3 classes are designed to vary in intensity based on your individual potential, and engages you in low-impact, high-intensity exercise. What does this class offer me? Many people are hesitant to join a fitness class for a multitude of reasons. Maybe you are insecure about working out in front of other people, or feel pressure to be able to perform a certain way. Perhaps you are feeling bored with your current exercise routine and are not seeing the results you want, but are unsure of what else you can do. Fitness classes at Twitch, By The Lagree Studio offer fun, social environments where people are supported and encouraged. Group fitness can target multiple muscle groups more efficiently than most gym goers could do on their own, and in a shorter amount of time. Trained, certified instructors can ensure proper form. We don’t expect our members to be fitness experts – that’s our job! When you come to one of our classes, you can feel comfortable knowing that you have an instructor who has dedicated their lives to helping people improve their health. They understand the physics and mechanics of the human body, and are able to recognize when your form isn’t optimized for maximum results, and help you adjust. Choosing an exercise class that offers the above is key to seeing results. If you are not comfortable in your class, if you are not being pushed to the extreme, and if you are not being advised by a certified instructor, you might not see results or reach your full potential. The t3 approach is one of the most intense exercises you’ll ever experience. Our trainers uncover your limitless potential to ensure that you are getting the low-impact, high-intensity workout that your body craves. Check out our schedule, and get started on your t3 journey today!